Survey Of Nurses Finds Lack Of Knowledge About Maternal Mortality : Shots - Health News A nationwide survey shows that postpartum nurses often fail to warn mothers about potentially life-threatening complications following childbirth, mainly because they need more education themselves. A study published Tuesday in MCN: The American Journal of Maternal/Child Nursing substantiates some of those concerns. Researchers surveyed 372 postpartum nurses nationwide and found that many of them were ill-informed about the dangers mothers face after giving birth. Needing more education themselves, they were unable to fulfill their critical role of educating moms about symptoms like painful swelling, headaches, heavy bleeding and breathing problems that could indicate potentially life-threatening complications. By failing to alert mothers to such risks, the study found, nurses may be missing an opportunity to help reduce the maternal mortality rate in the U.S., the highest among affluent nations. An estimated 700 to 900 women die in the U.S. every year from pregnancy- and childbirth-related causes. Another 65,000 nearly die, according to the Centers for Disease Control and Prevention. The rates are highest among black mothers and women in rural areas. A recent CDC Foundation analysis of data from four states found that close to 60 percent of maternal deaths were preventable. Nearly half of the nurses who responded to the survey were unaware that maternal mortality has risen in the U.S. in recent years, and 19 percent thought maternal deaths had actually declined. "If [nurses] aren't aware that there's been a rise in maternal mortality, then it makes it less urgent to explain to women what the warning signs are," says study co-author Debra Bingham, who heads the Institute for Perinatal Quality Improvement and teaches at the University of Maryland School of Nursing. Only 12 percent of the respondents knew that the majority of maternal deaths occur in the days and weeks after delivery. Only 24 percent correctly identified heart-related problems as the leading cause of maternal death in the U.S. In fact, cardiovascular disease and heart failure — which, according to recent data, account for more than a quarter of maternal deaths in this country — were "the area that the nurses felt the least confident in teaching about," says Patricia Suplee, an associate professor at the Rutgers University School of Nursing in Camden, N.J., and the lead researcher on the study. Nurses also said they spent very little time — usually 10 minutes or less — instructing new moms about warning signs of potential complications. Many of the nurses said they were only likely to discuss such life-threatening conditions as pre-eclampsia (pregnancy-related high blood pressure), blood clots in the lungs or heart problems "if relevant," though it was unclear what that meant. As the study noted, "it is impossible to accurately predict which women will suffer from a post-birth complication." The post-delivery education provided by nurses is particularly important because once a mother leaves the hospital, she typically doesn't see her own doctor for four to six weeks. Up to 40 percent of new moms, overwhelmed with caring for an infant and often lacking in maternity leave, child care, transportation and other kinds of support, never go back for their follow-up appointments. 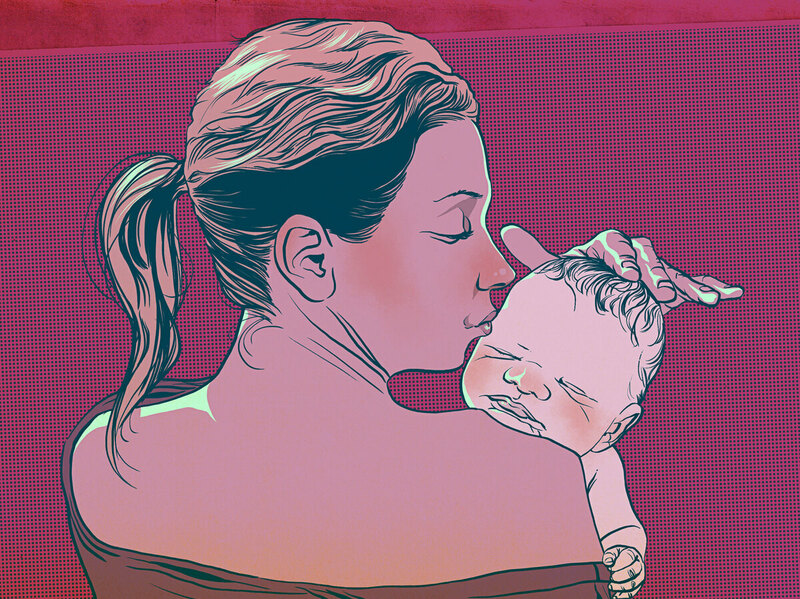 Figuring out the best way to instruct new mothers is all the more crucial, the survey noted, because the first days after giving birth are "exhausting, emotionally charged and physiologically draining" — hardly an ideal learning environment. But like so many other important aspects of maternal health care, postpartum education has been poorly studied, Bingham says. The respondents, of whom nearly one-third had master's or doctoral degrees, were members of the Association of Women's Health, Obstetric and Neonatal Nurses, the leading professional organization for nurses specializing in maternal and infant care. The association began looking at the education issue in 2014, when Bingham was the association's vice president of nursing research and education. "We had to start really from the ground up, because we didn't know exactly what women were being taught," she says. In focus groups conducted in New Jersey and Georgia, two states with especially high rates of maternal mortality, researchers discovered that postpartum nurses spent most of their time educating moms about how to care for their new babies, not themselves. The information mothers did receive about their own health risks was wildly inconsistent and sometimes incorrect, Bingham says. The written materials women took home often weren't much better. Some nurses were uncomfortable discussing the possibility that complications could be life-threatening. "We had some nurses come out and say, 'Well you know what, I don't want to scare the woman. This is supposed to be a happy time. I don't want to seem like all I want to talk about is death,' " Bingham says. But the researchers also found that nurses could be quickly educated with short, targeted information. Using insights from the focus groups, an expert panel developed two standardized tools: a checklist and script that nurses could follow when instructing new mothers and a one-page handout of post-birth warning signs that mothers could refer to after they returned home, with clear-cut instructions for when to see a doctor or call 911. Those tools were tested in four hospitals in 2015. "Very quickly, we started hearing from the nurses that women were coming back to the hospital with the handout, saying, 'I have this symptom,' " Bingham says. One of them was a Georgia mom named Sarah Duckett, who had just given birth to her second child. A week later, she recognized the warning signs of what turned out to be a blood clot in her lung, a postpartum complication that can be fatal. "Those were anecdotes, but they were very powerful anecdotes," Bingham says. "I've led multiple projects over the years, and rarely do I get such immediate feedback that something is working." The shortcomings documented by the national survey could foster wider use of these tools, suggests Mary-Ann Etiebet, executive director of Merck for Mothers, which funded the study as part of a 10-year, $500 million initiative to improve maternal health around the world. "Something as simple as creating educational and training programs for nurses ... can have a real impact," she says.